The Sheffield Civic Trust (SCT) held a supplementary consultation event in June 2015 on proposals for the Sheffield Retail Quarter which ran alongside the main consultation. This was widely advertised through our supporters network via the SCT newsletter. The Sheffield Retail Quarter team is to be commended for committing time and effort to the SCT event and to committing to a continuing process of consultation. The event was well attended and this, along with a briefing held earlier in the year with SCC lead officer, Nalin Seneviratne and SCT Trustee’s feedback from the official consultation, forms the basis of the Trust’s response. The SCT has featured some of the detailed comments received on the SCT blog. We have also put out a call for further comment and contributions and aim to submit these to the Sheffield Retail Quarter team as a continuing process. The challenge of the earlier Sevenstone scheme was how to integrate a shopping centre into the centre of the city. For this new scheme, the SCT wants to see a renewed city centre with great streets and squares and retail/offices and homes – rather than a stealth shopping centre or a quarter only designed for the needs of retail. We recognise that the scheme proposed is bold, creating new streets linked to new and existing public spaces. The scheme is shaping up with an emphasis on streets, quality of spaces and conservation of historic buildings – all these aspects are welcomed and supported by the Trust. The feedback here is intended to be detailed, informed and positive. We have reviewed various themes that have been raised during the consultation and we aim to make clear recommendations on this basis. The scheme clearly responds well to the feedback from retailers. The new Fargate, the square outside John Lewis and the linking street back to the Peace Gardens and Pinstone Street form a circulation route of desirable retail space. It is like the diagram of a shopping centre made up of open air streets and squares: this works well but does result in large block sizes. The challenge will be for this new development to fit well with the existing grain of the city centre and not appear as a new monolithic development. The conservation of various buildings within the development area is a good start but the proposals are still indicative and the model shows monolithic blocks and large plots. The city centre is made up of a mix of uses and to work well as a safe and lively place throughout the day and across the seasons a monoculture of single use must be avoided. This scheme has the potential to increase density and the mix of uses right at the centre of our city. It will be essential to achieve mixed use horizontally (in layers) as continental cities do to create an vibrant city centre. The residential component of this plan is underdeveloped in the current plans. Perhaps The City Council are worried that rooftop residential development will add risk to the scheme. There is enthusiasm within SCT for innovative urban housing design, offering a fantastic city centre neighbourhood that sets the standard for urban living in the UK. Whilst the accent on mixed use is vital to a vibrant city centre, the impact of more intensive noise-generating use on other users must be considered carefully. The increase in density and double stacking of units should allow for the planning of shops at street level with apartments, offices and facilities for city centre residents above (gyms, galleries, social places, etc). Offices that also break the mould might be included and it follows that access to offices, facilities and homes should be from doorways on the streets. This will ensure activity and safe streets 24/7. This mix of uses could also result in a more varied and richer roofscape. Disability access should be considered at this early stage of planning to ensure a fully accessible development. It is important that there should be facilities for families who come into the city centre because it makes life easier when having to take small children shopping. Play space could include small climbing sculptures and have dual purpose, both artistic and useful! the type of offices should offer alternatives to the current offer i.e. upper floor large floor plate, large span, top lit offices work? play space in the public domain areas should be considered. The importance of this development being ‘Sheffield like’ and not like any other city has come up in most conversations. The recent outcry about the loss of independent traders in the Devonshire Quarter demonstrates this, people love their city because it is different and has a strong streak of independence. How the designers meet this challenge will be key to the success of the retail quarter. It is understood that the proposals do not show the architecture of the developed scheme and that what we see on the model and 3d drawings is indicative. Concern was raised at the consultation presentation about ‘the architectural character of the proposal’ and the need for the place to be ‘individual, unique to Sheffield – not like Guildford’ and this view is shared by many people. The proposal for an RIBA competition from The Sheffield Society of Architects is a welcome one, and the selection of a range of the best architectural talent as designers for the buildings will ensure variety and specific responses to Sheffield’s identity. The illustration of the new square demonstrates the worry many have expressed as it looks like it could be a retail quarter in Liverpool, Birmingham or Manchester, or even the Middle East. It is dynamic and may sell the scheme to retailers but the reaction from Sheffielders is that it is not the image of their city. The quality of this crucial new square needs to build on the characteristics of our much loved public space – craftsmanship, quality materials and planting. The architectural backdrop needs to speak of or respond to Sheffield in some way. It is essential that all of the streets and public spaces within the new scheme’s layout are genuinely public space and not spaces which just have public rights of ways through them. It would be retrograde step if any streets which are currently completely open are downgraded to become managed quasi-public/private space and lose their open access. The quality of landscape will be vital and should build on the character of the city and its many green spaces, as has been achieved in the Heart of the City development. serious consideration of how the scheme differentiates from other city centres must be made and set out in the briefs for the designers. that a mixed design procurement approach is taken to ensure that some smaller, less ‘corporate’ design studios contribute. The Sheffield Retail Quarter must feel like a continuous part of our city centre and be accessible to all, with no gates or privatisation. The design concept is reliant on the anchors of the large department stores – M&S and John Lewis. M&S is currently well integrated into Fargate, however the large store proposed at the end of new Fargate acts as a full stop, that turns its back on Trafalgar Street and the area beyond, and will discourage pedestrian flow through this part of the site to Fitzwilliam Street, Devonshire Green and Division Street. The car park, potential bus/taxi drop off, service area and click and collect proposals behind this anchor store all have the potential to exacerbate this disconnection. The all important sightline from Fargate to the new John Lewis has been questioned. It is a strong generator cutting across the street pattern, but the line is not completely straight and clear and will it work as conceived? Some were not convinced by the sightline when looking at the model. Perhaps the revealing of the store is a better townscape principal – think the gently curving Oxford High Street and Gordon Cullen’s work where experiencing the sequence of spaces and the staged revealing of a street or place makes for a better experience. The long view along the new Fargate to the new anchor (John Lewis) looks to be dominated by the revamped Telephone House. From both the model and sketch perspectives this slab block that will sit behind John Lewis could dominate this important vista. Accurate computer generated Images and detailed studies are needed to convince us that this key view will work. The massing and external treatment of the new store will be essential to the success of the sight line and vista along the new Fargate. There is clearly strong support for John Lewis remaining in the city centre and for it to be one of the anchors but there is no plan B if John Lewis does not agree to move. It is therefore a major concern that the current scheme is dependant on the current store being demolished. If the existing John Lewis store is demolished then its replacement should have a sense of grandeur, civic pride and scale that its prominent position in Barkers Pool and opposite City Hall demands. It is important that this replacement building is given as much attention as the new ‘anchor store’. It is also important that Barker’s Pool does not feel downgraded or bypassed as the back of the new scheme. Barker’s Pool is a much loved civic space and proud home of the city’s war memorial. The new Fargate will be an important pedestrian access route into the new scheme but this shouldn’t be prioritised over Barkers Pool. The circulation pattern could be more like a Y-shape with one branch leading into the new scheme and the other leading into Barkers Pool and towards Division Street. Barker’s Pool must be considered as an important public space and link through to Division Street. There has been much discussion within the SCT about what retail will look like in 20/30 and even 50 years time and how the retail quarter will respond to this. Currently the retail space proposed responds to the views and needs of potential tenants, but is the large floor plate, deep plan, narrow frontage space future proof – if these stores are moving towards a showroom with pick up, are the floor plates shown the future and can flexibility be built in? The current scheme has two strong anchor stores, M&S and John Lewis and a new circuit, drawing the city centre onwards the core and shortening the retail spine. This raises the issue of displacement. As the retail spine reduces in length what replaces the empty units on Castlegate? The displacement of shops with other sustainable uses needs to be planned and be integral to the current plans. the large frieze on the rear of Barkers Pool House by leading 20th century sculptor William Mitchell should be retained and moved to a more prominent position within the new scheme. contemporary artists should be commissioned to produce public artwork within the new public spaces and on new buildings. The retention of public buildings is an aspect of the scheme that has been universally welcomed. The new Fargate puts Leah’s Yard at the centre of the scheme and the use of this space for food could work, and would bring a use to the courtyard space. The value of this space on the new Fargate should not however exclude consideration of other uses. A cultural/creative/independent use for Leah’s Yard, or other historic buildings might bring richness and broader appeal to the scheme. The Bluecoats Gallery in Liverpool One is a good example of what a cultural use could bring to the retail quarter. The city could work with one of the many cultural organisations to look at the possibilities of this space. Space for charities and third sector uses should be considered to ensure a vibrant mix of uses and access for a broad section of the population. One of our supporters, Craig Broadwith made a key point that the heritage is about the townscape, not just the buildings. The new quarter is being designed around a major store and new retail street, Fargate rather than working with the historic street pattern. What results is a breakdown of the streets around the new department store (John Lewis) and poor connectivity behind it. Perhaps this is a necessary sacrifice to make the development work, however if so the effects on connectivity should be mitigated. The wholesale destruction of what exists within the Sheffield Retail Quarter boundary to create several new streets, rather than working within existing street patterns presents a huge risk. This contrasts with the way improvements are being phased on The Moor which has the effect of mitigating the potential for blight. Conservation of historic street patterns would allow more retention of buildings and allow a more gradual renewal. that provision of space for charities and the third sector should be considered. There was enthusiasm for good pubic transport links and for sorting out the circulation of buses within the city core. Questions have been raised about the facilities for cyclists and for convenient cycle and car parking for short visits. Pedestrians, cyclists and drivers navigating through traffic to the proposed retail quarter have not been fully considered. Consideration of pedestrians, cyclists is not clearly shown in the proposals. If the Sheffield Retail Quarter is successful this and all the other central car parks will fill up, as will the roads. Sheffield will suffer poorer air quality as a result. The proposed car parking will be further from the retail core than present. With the closure of John Lewis, Grosvenor and Wellington Street and old Fire Station car parks, it should be demonstrated that the new levels and distribution of parking will not affect the economic performance of the wider city centre as well as the SRQ. The scheme moves the centre of gravity of the city centre away from the tram network so tram users will also find the city centre shops less accessible. The removal of buses from Pinstone Street would also make city centre shops less accessible to bus users. A two directional bus service via Pinstone Street would make it easier to ‘step off’ and shop. If major bus routes through Pinstone Street are to be removed, this could be an opportunity to reintroduce the ‘FreeBee’ bus service which uses smaller buses and could operate in a loop in and around the SRQ. Such a service could provide a link between the scheme and tram stops. The Sheffield Retail Quarter team has committed to a continuous process of consultation. The Trust is keen to respond in an active and positive way to this commitment. This document has been compiled from a passionate body of opinion, compiled from views expressed by SCT trustees and supporters. We welcome this genuine initiative and have made definite recommendations on each area of considered. We see this as the first step in efforts to make this the best scheme for Sheffield and an example to the rest of the major UK cities. We therefore ask for detailed consideration of our recommendations and clear and a comprehensive response. This is Sheffield’s opportunity to be confident and create a liveable, forward looking city centre which has a strong identity and sense of place. Great to see this detailed and carefully considered response. No mention of environmental concerns anywhere though, apart from transport. Please can Sheffield Civic Trust think about climate change, how the city can deal with overheating in coming years (Sheffield will regularly hit 30 degrees + in the summer) and downpours (more storms predicted). We need the City Council to consider how to integrate passive and natural means of climate change mitigation (good quality insulation, renewable energy etc) and climate change adaptation (shading of streets as well as sunny spots, wide use of greenery to reduce flash-flooding and mitigate overheating of streets). If it is not in the Retail Quarter brief from the start, it is too late – you cannot bolt this stuff on – it is more economic to future proof now – and it feels good too! 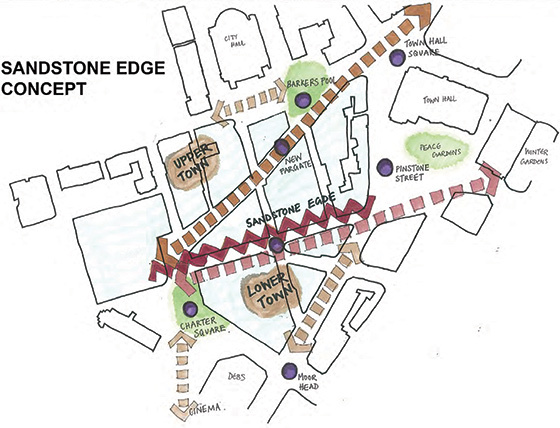 I was at consultation at Fargate and listened to what people were saying and they basically felt that it would lose the historic character of the area esp Cambridge Street as there are 4 heritage buildings leading down from Leahs Yard to Pinstone Street. They felt the retail was too much given there is also the Moor and a lot of empty shops in between. People who came from other cities such as Manchester said they felt that the era of big shopping areas was fading. Some were concerned that emphasis on big chain stores was risky in view of many chain stores are pulling out of the high street. They felt independents was more sustainable. One cyclist felt that there should be more provision for locking cycles in the main shopping streets. Many commented on the length of pedestrian area and wondered how disabled people would fair with such a long way from parking to store or indeed anyone carrying shopping. Others felt that there should be more residential and more emphasis on city living as this is what is happening in other Urban areas throughout the world. They felt there was not enough emphasis on current residents. However none really talked on the environmental impact of all the demolition rubble and the cost of building new both from environmental & financial aspect of what is an extremely risky venture given the current retail climate. Keeping the front of some old buildings does not mitigate the environmental damage & extra cost when less drastic alteration and retro fitting would be less damaging less costly and keep the city centre more adaptable and less likely to have an empty hole in the centre such as Bradford had for such a long time. Large retail areas are not consistent with current research. Nor is the demolition of old heritage buildings. Research proves that Heritage buildings draw in investment and occupiers from a wide mix of businesses and that is exactly what this city centre will be blocking out. This is the economic plan slightly rejigged that the Council made 20 years ago based on some new research some 15 years ago and is not responding to changes in the Urban economy or even the change re the 2 universities. Hallam now being the 4th largest Uni in the UK.